Take your chicken dinner to another level! Lemon, basil, mustard, and garlic add bright, unexpected flavors to the same-old grilled chicken. This recipe is easy to make—even the kiddos can help—and it takes almost zero prep time. It's also made with ingredients you probably already have in the spice cabinet and fridge. Serve on bed of quinoa or rice and pair it with a yummy green veggie for a healthy, filling, gluten-free meal. 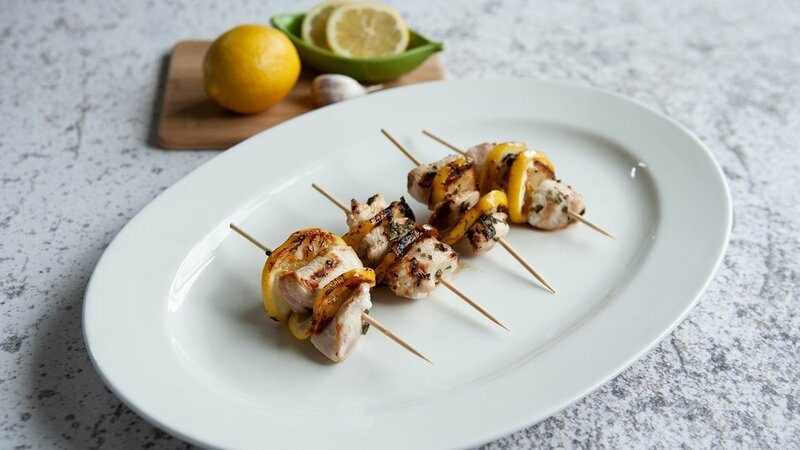 Place on skewers, alternating a cube of chicken with 1 slice of lemon, folded in half. Mix lemon juice, garlic, salt, pepper, olive oil, basil, and mustard. Brush juice mixture over skewers (on both sides). Grill over medium-high heat for approximately 4 minutes per side and serve. Note: Soak 16 bamboo skewers overnight.